Rasraj is an inter-specific polyembryonic hybrid developed for resistance to bacterial canker disease by breeding. 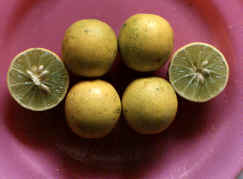 The hybrid derives genes for canker resistance from the Nepali Round lemon parent and other characters from the acid lime parent. The fruit is yellow coloured, weighs on an average about 55g containing 70 % of juice and 12 seeds. The rind is thicker than lime. The acidity is 6 % and TSS is around 8° B.